Okay, so maybe you had a bad week. Maybe you got passed over for that promotion. Perhaps your significant other broke up with you. There might be a relative staying with you that you really do not care for at all (I can think of two of mine that would qualify). Well, my friends, it could be worse. 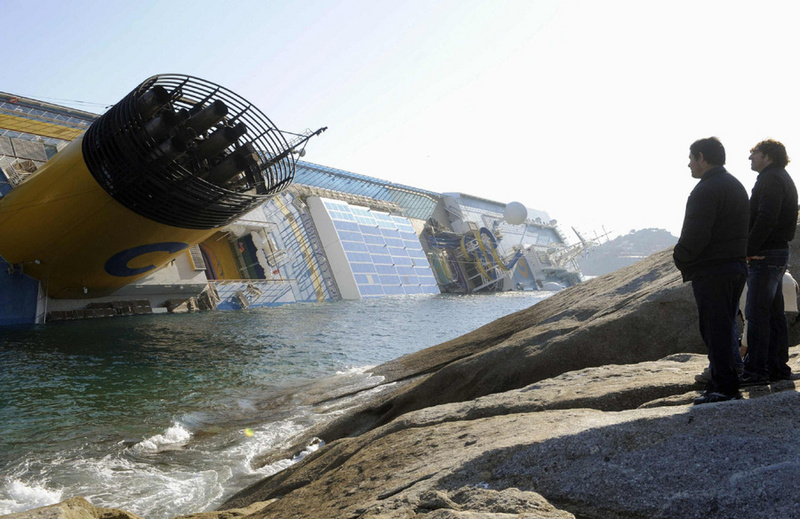 Your name could be Francesco Schettino, for instance. 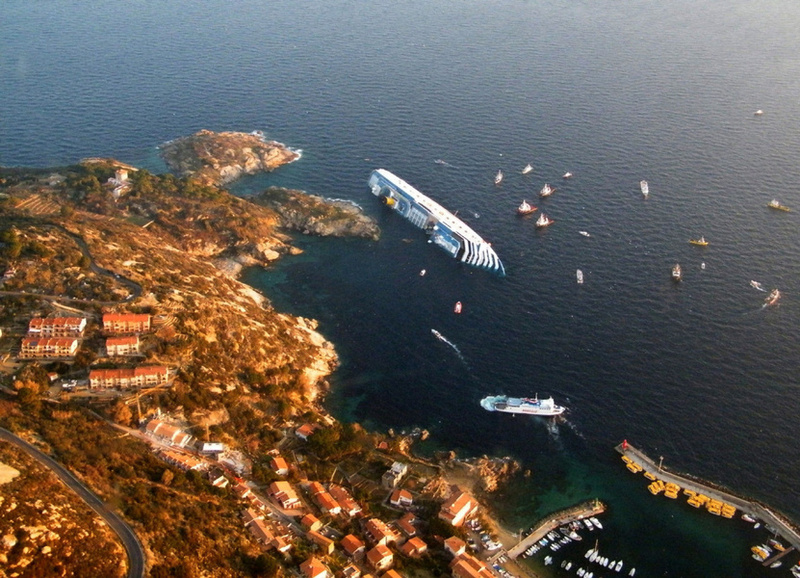 It's been a few days now since the cruise ship Costa Concordia ran aground just off the island of Giglio in the Tuscan area of Italy. The story has caught the attention of the world's media, of course. 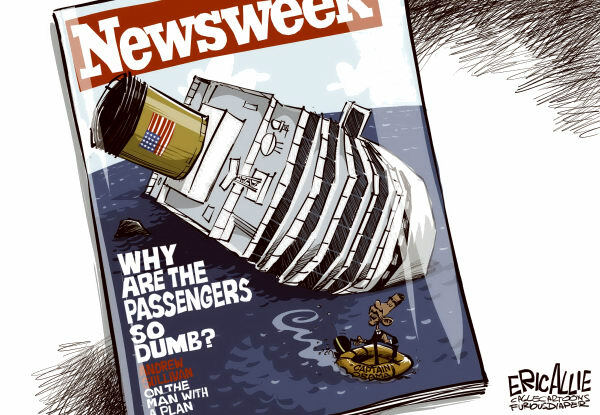 Not because of a high death toll; of the thousands on board, most are safe and alive, and only a handful died or remain missing. Realistically, more people die in a day's worth of sectarian violence in Kabul or Nigeria. No, the attention is because of the strange nature of the accident, the location it happened in, and the contrasting tales emerging out of it. 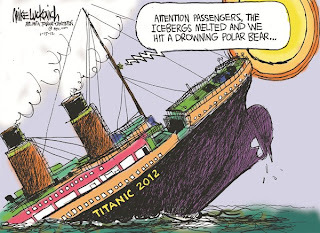 That, and this year is the centennial of the Titanic disaster. Some troubling parallels between the two are being made, and with good reason. Captain Francesco Schettino (who's probably having the worst week of his life... it's rather difficult to top this) is facing some serious charges, including manslaughter and abandoning his ship, after a wee bit of a mishap. It turns out that he didn't seem to understand the notion that it's a really bad idea to bring something that big so close into shore, and, well... you can see the rest. The general rules of the sea have it that ships are supposed to pass by the area several kilometres offshore. 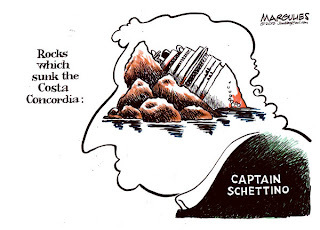 Instead, Schettino deviated from course, apparently to send out a hail to a local, knocked the ship into a submerged rock or reef (which he claims his charts didn't show, a surprise to any other mariner and all of the locals, who knew well that it was out there). The ship listed, keeled over, and capsized. 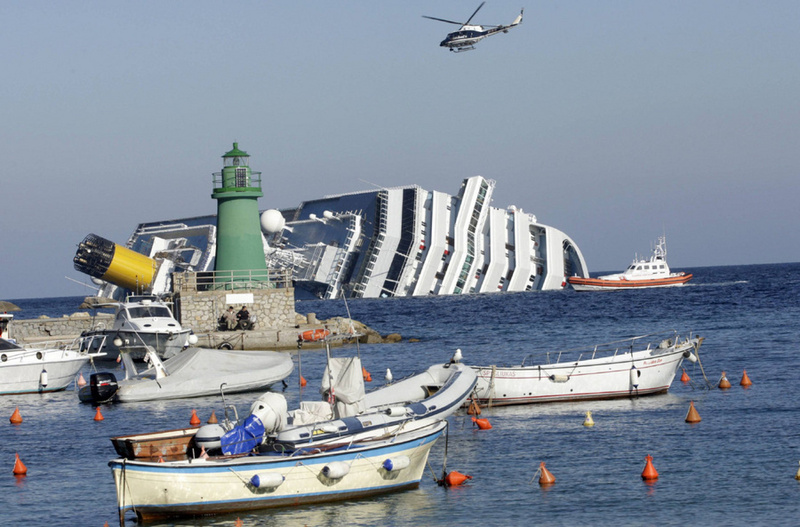 Of course, by then, Schettino was well off the ship, having had, it seems, scarpered early on in the evacuation for a lifeboat (he claims he fell into a lifeboat, and couldn't bring himself to get back on board. He claims a lot, even that his maneuver saved thousands of lives). 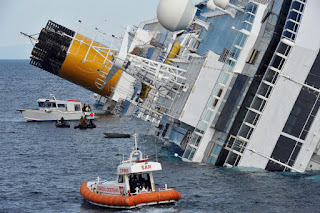 This is a very bad thing for ship's captains, who in such an instance are supposed to stay calm, keep good order, and ensure that all surviving passengers are off the ship and accounted for before even thinking of leaving. By all accounts, many of his officers and crew followed their captain's less then sterling example, though there were exceptions. The passengers themselves got off either in lifeboats or by swimming ashore, or were taken off by arriving Coast Guard units or locals. It's bloody fortunate, in a way, that the incident happened so close to shore; too much time spent in the water this time of year is certain death. The population of the island itself is small, just some 1500 souls, so you can imagine they were quickly overcome with four thousand harried survivors arriving on shore, but it seems they responded as people do in these cases: with the utmost speed, hospitality, and organization, helping out, doing all they could. Now they get to play host to the world's media. From what I've seen, the island looks like a nice spot. It's just not the sort of way the locals would have liked to get the world's attention, is it? Schettino himself has claimed the title of the most hated man in Italy for his foolishness, incompetence, and cowardice, and odds are he won't be the only one facing charges. 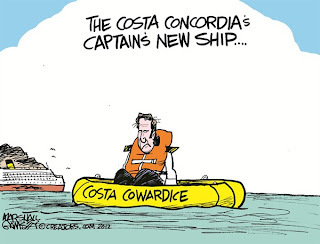 Costa and its parent company Carnival Cruise Lines are hanging him out to dry, casting the blame for this debacle on him. And from his inconsistent stories, it's pretty clear the captain panicked, did pretty much everything wrong that he could have, and one single bad decision has now ruined the rest of his life forever. 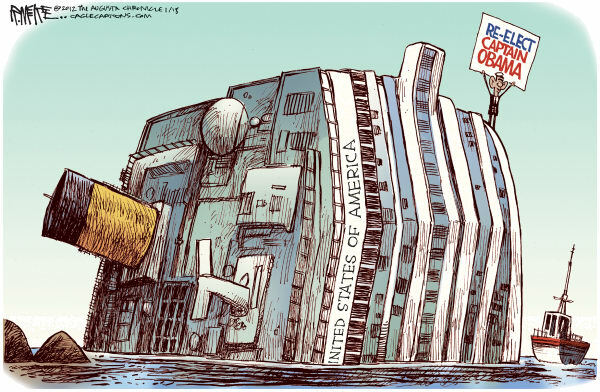 I'll say this: when he screws up, he does a thorough job of it. 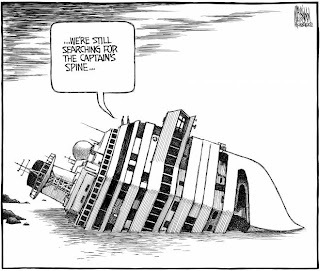 I do think the cruise ship industry, however, shoulders some of the blame. 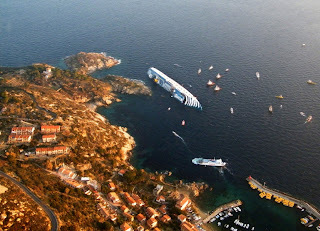 Some of the commentary since this all started points out how these gigantic monstrosities are being built more as floating lavish hotels, complete with social directors to take care of every bit of the passenger's vacations. The industry builds these things without real consideration of how safe these things are (shades of Titanic all over again). Their prime consideration is how much money they can make out of the ships. 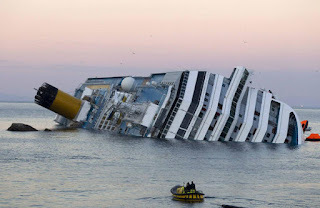 Most of the crew are there for the entertainment of or the taking care of passengers, and seafaring skills are irrelevant. 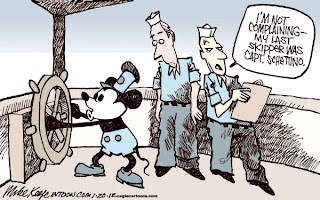 The cruise lines pay their people little and house them poorly onboard, compared to the amount of work they do (one of the many reasons I'd find cruise ships to be a horrible vacation idea). From the reports, it seems there was little organization and no sign that the passengers had been given instructions on safety procedures (which is supposed to happen soon after a ship is launched). 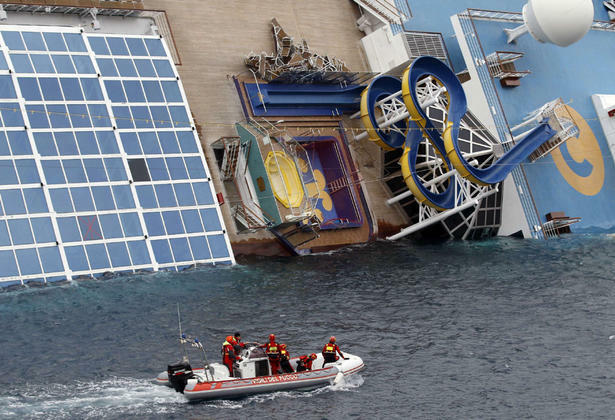 And serious questions are being raised about the stability, engineering, and crews of these behemoths. These ships don't maneuver particularly well with rough seas, and unlike decades ago- or in the Navy, Coast Guard, and merchent ships elsewhere today- seem to have officers and crew who aren't at all mariners. They rely far too much on automation and computers to do the work for them. And when you have a fool and a daredevil in command, you have a recipe for disaster. 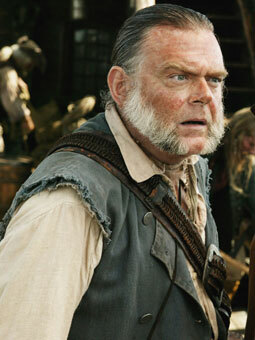 There are, of course, superstitions about the sea, old traditions. One involves the christening of a ship with a bottle of champagne. 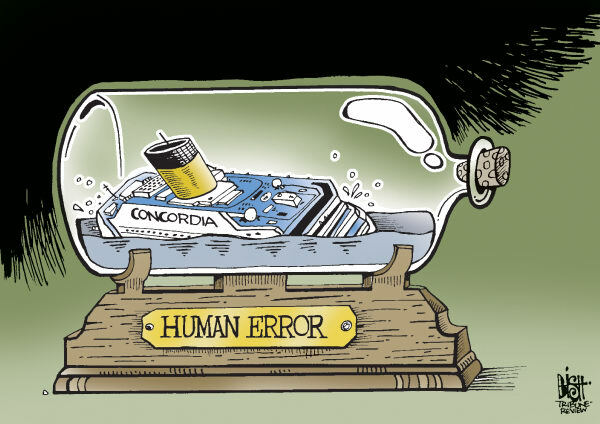 I've heard that when the Concordia was christened, the bottle didn't break. An omen of things to come, perhaps? For some reason, I find myself picturing the inevitable movie (James Cameron is probably already planning it), with Kevin R. McNally playing yet another crusty old sea dog, muttering under his breath through the whole film. "Bad luck, the bottle not breaking. Bad luck, the captain being a coward and a drunkard. 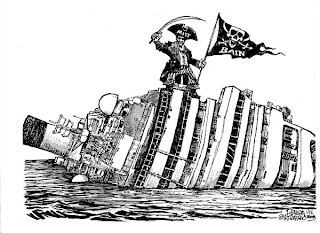 Bad luck, going into shore like that in a panic..."
The story continues to unfold as of this writing. Schettino has singlehandedly destroyed his own life through his own foolishness. Lives have been lost. 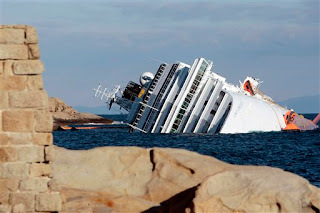 The status of the ship has yet to be determined, as dive teams work to search for the remaining missing, and the salvage teams stand by to work. An environmental headache may ensue, given that fuel is still on board, and the area it's in happens to be a national park. 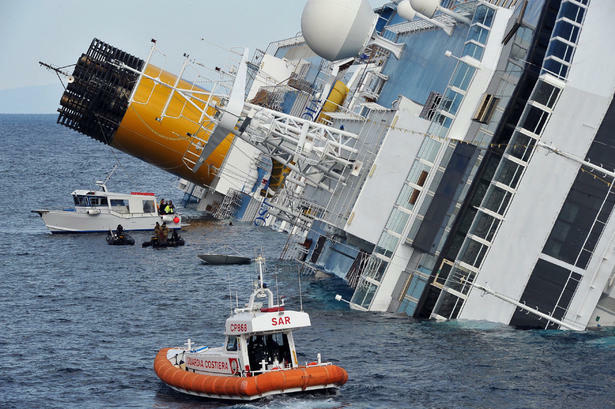 And last and certainly least, the cruise ship industry stands to lose a lot of money this year because of the bad publicity. 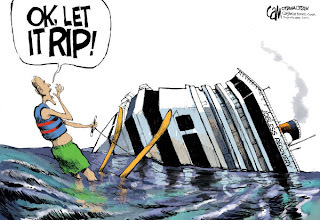 There are people who think cruise ships are an ideal vacation. I would consider them cruel and unusual punishment, particularly being at the mercy of an overly cheerful social director who has every second of my vacation planned out. I'd much rather be climbing a rock face or hiking in some grand scenic vista, thank you very much. 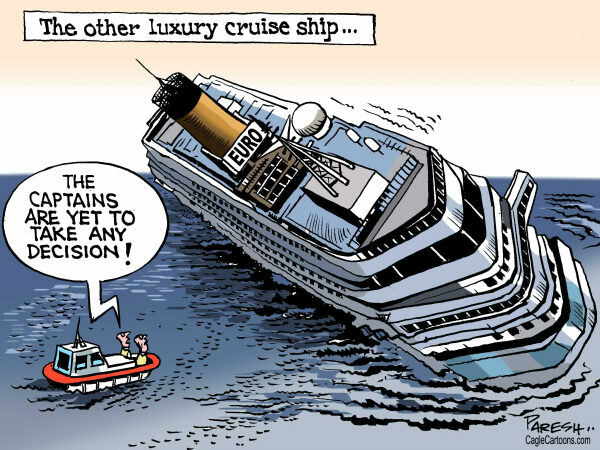 Obviously the cruise ship industry would not approve. 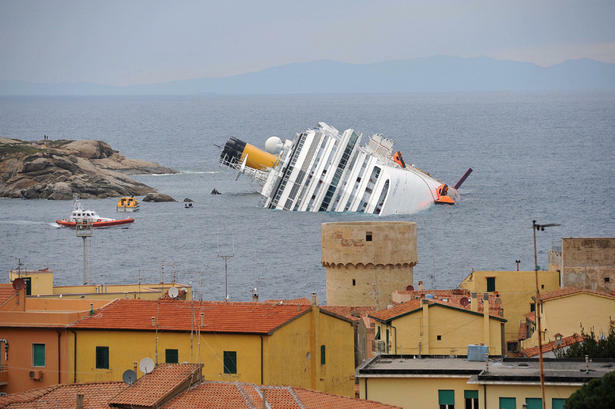 Postscript: to the Schettino family: you may want to consider changing your last name. Word has it that the dictionaries plan to have a picture of Francesco Schettino right next to the words gutless coward and incompetence. 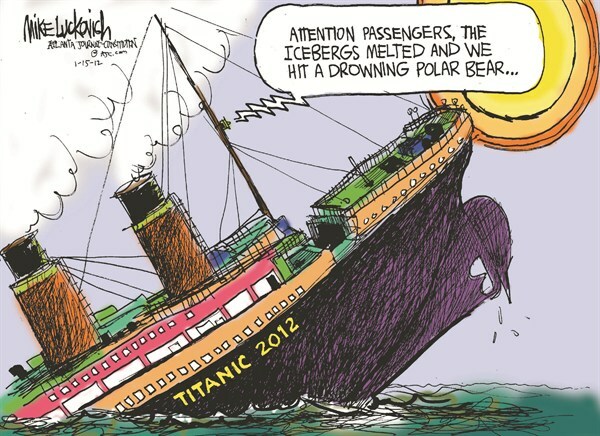 Actually, the Discovery Channel has something in the works. I'd like to get one of those T-shirts. I'd wear it. Not many people around here speak Italian. My late Uncle Tony (by marriage) was Italian. How would have approved, I think. Yes, you did! I didn't think I'd be writing about Italy again so soon! 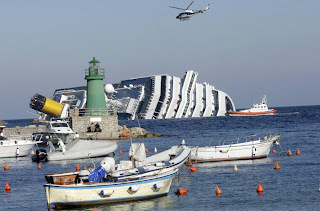 I've always wanted to go on a cruise, perhaps to the Mediterrean (sp?) but, alas, I'll probably never get to go unless I win the lottery. 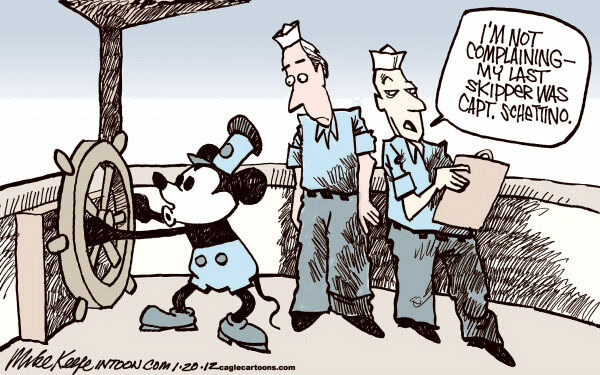 However, if I ever do, I will be sure to make sure I find out the captain's name before boarding. Swim with the fishes, with cement shoes on. I've a hunch the Italians will punish this guy to the full extent of the law. 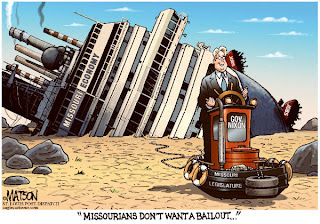 But I fail to see why President Obama would be in a cartoon. The USA is going up, not down; things have turned around. I was wondering if you would write something about this, and boy did you ever. 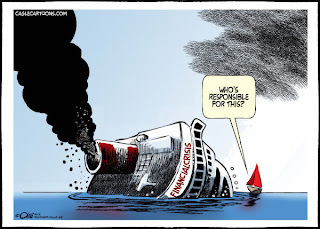 I don't like cruises for the environmental damage they do. Years ago when I lived in California the LA Times or Orange County Register (?) had an article about where the trash really went. Awful. 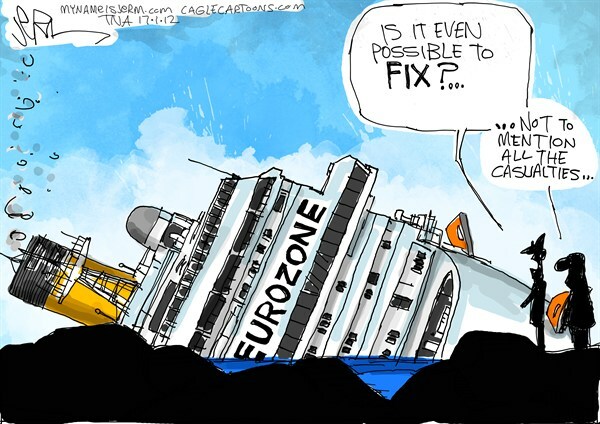 I hope they have fixed that problem. 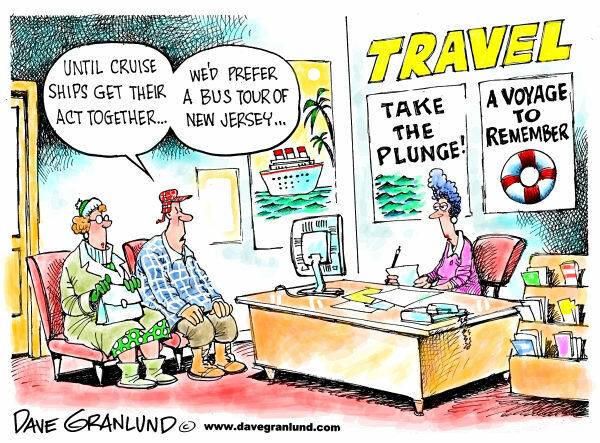 Plus I always thought the ships are getting way to big and who wants to travel with 4 thousand people ? A smaller ship seems to be the way. PBS has been running a commercial for a cruise ship that travels the rivers in Europe that looks quite lovely but a much smaller ship. 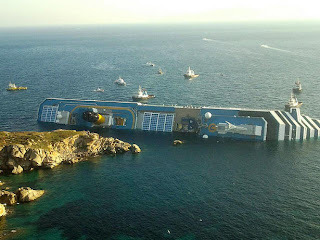 If I ever did something like that I would have to check out the complete running of the ship. That said, I must admit that I always wanted to travel with Poirot in "Death On The Nile" or "Problem At Sea" but that is just a dream. 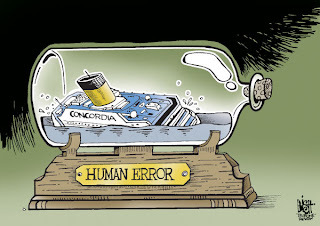 I suppose before going on a cruise we should check the captain's credentials and safety records. Makes one think twice, esp in that part of the world! 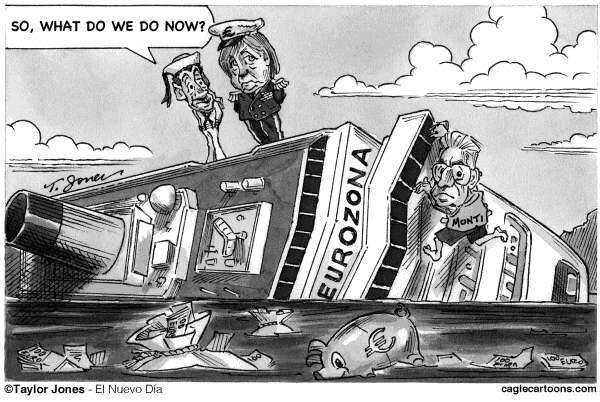 It is really a shame! 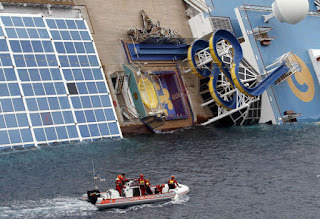 I used to think it would be fun to go on a cruise ship now after hearing all these horror stories - no way! 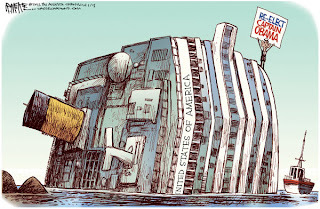 Remember the cruise ship that had engine trouble and the passengers were stranded with no food, water, electricity, A/C, and the toilets were backing up! The only thing they had to eat was Spam out of the can. Ugh. I think I'd launch my own lifeboat. 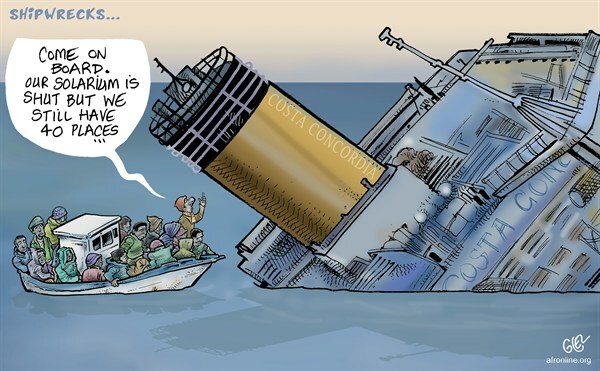 Plus there are the stories of people falling or being thrown overboard and never being seen again. 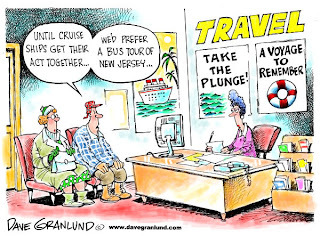 Not to mention all the drunk obnoxious passengers! I think I'll just go to Wisconsin Dells and hang out in the wave pool! As my great uncle says, "What a mess!" It's a truly awful tragedy. Just awful. 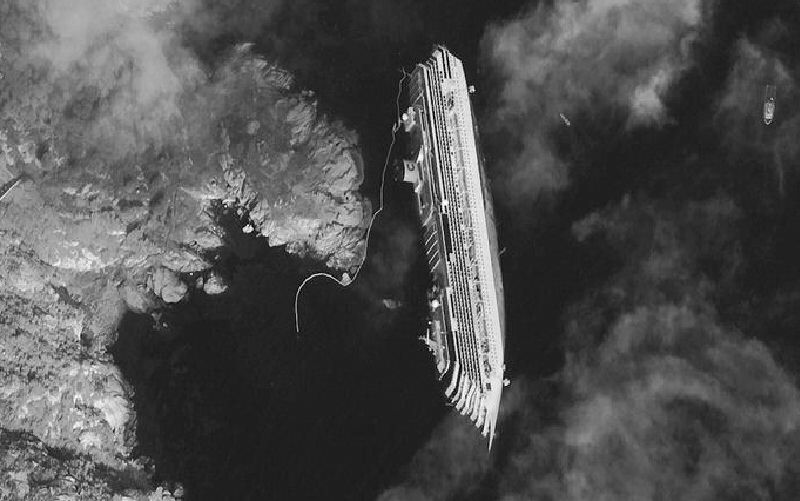 I've NEVER wanted to go on a cruise. Now I really don't want to. So sad. I wonder how many people are reconsidering ever going on a cruise. 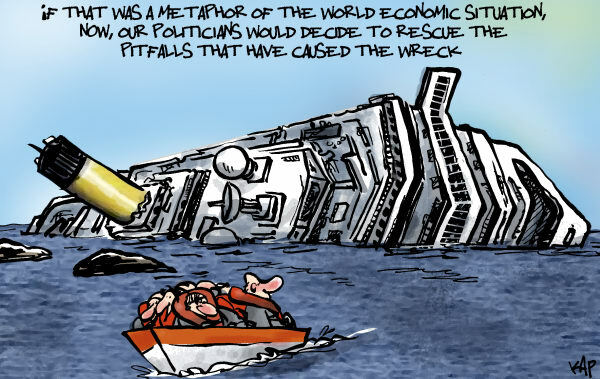 Comics writers do an awesome job of capturing the moment with satire. Sad story. 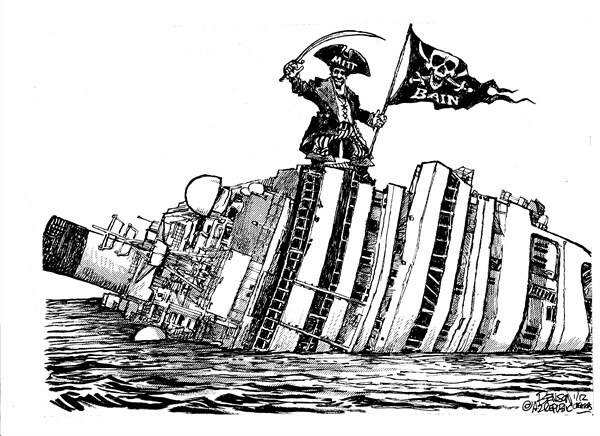 The captain has brewed his own hell and is stewing in it. Truly, the one bright spot in this tragedy is that not all Captains are simpering cowards. Hail Coast Guard Captain De Falco!